In this article we have concentrated on showing as many varied CSS techniques that cover the full spectrum of website interactivity. Thus we have intentionally minimized the number of pure CSS navigation methods, of which there are hundreds. The Econsultancy Marketing blog has an interesting effect using CSS that allows their logo to change as the page is scrolled. You’ll notice the logo changes from a solid version to an outline version. This article will show you how this effect is achieved. You might be familiar with the plugin jQuery Dock which allows you to create a menu like Apple Dock. With this tut, you will learn how to create a similar menu with bubble effect by using only pure CSS. The tutorial includes two methods: CSS sprites (basic) and image swapping (advanced). The general idea of SlickMap CSS is to streamline the web design process by automating the illustration of sitemaps while at the same time allowing for the pre-development of functional HTML navigation. An accor­dion effect can be achieved using CSS3’s :target pseudo-class, without needing JavaS­cript. Using the pro­pri­et­ary -webkit-transition prop­erty this accor­dion can also be animated. Each part of the accor­dion has an ID, head­ing, and con­tent region. The header includes a link that matches the section’s ID, while the con­tent is wrapped in a con­tainer which will con­trol its display. These icons are a phenomenal example of what can be achieved with CSS. Yes, those social media icons really are created using only CSS and HTML markup. While they may not be used as often as they once were in the heyday of HTML table based web design, image maps can still be quite useful in situations that call for it. In this tutorial, you’ll be shown how to build a pure CSS image map with background image sprites and cap it all of with a "tooltip" like popup, all with CSS. In this tutorial you will learn how to build a simple, clean and accessible pure CSS timeline with some very straight forward and basic markup. Data visualization is mostly achieved with flash applications or with help of some programming languages. Are those solutions the only way to present, let's say simple data chart? How about giving it a try with nothing but good ol' css? Bar charts in CSS are neither very new, or very difficult. Using some pretty basic styling you can force lists etc into resembling graphs and charts fairly easily. Such charts, in their most basic form, work perfectly well in displaying and presenting the data they represent. However, using some rich CSS3 and progressive enhancement, you can really start pushing the display and presentation of these normally boring documents to the next level. The intention of this tutorial was not only to enable data visualization to people that don't feel comfortable with using various scripting languages but also to demonstrate the power of CSS and present a way of using CSS a bit differently. Here's a simple demonstration of how you can create an animated progress bar using pure CSS. The trick is very simple, all you need is 3 elements, one container and 2 nested elements. Let’s say that you have a large image (or several large images) on a particular page, and you want to let visitors know that the image is loading. The technique, from Zurb, for these 'Super Awesome' CSS buttons, use descriptive class names and the CSS3 properties gradients and box shadows. And with a little more refinement, they have made these buttons look more actionable and refined while maintaining the ability to function as a button across browsers. 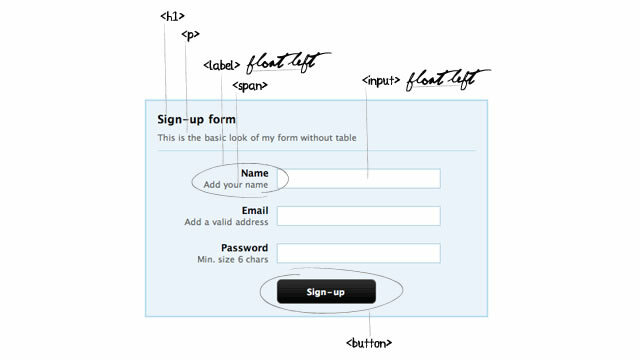 It is simpler and faster to use HTML table structures for forms rather than using only CSS properties. In any case, for CSS lovers, this tutorial illustrates a technique for a pure CSS form without using HTML tables. For those of you who don’t know, a vignette effect is a discoloration on the edges of an image. This effect usually appears in photography and it can be either accidental or intentional. The technique involves a few divs, a bit of simple CSS, and a whole lot of fun. Web browsers know which links on a page have been visited by a user (until the cache is cleared out, that is). It is up to you the designer to take advantage of that web browser’s knowledge if you choose to do so. The goal of this tutorial is to have a check mark preceding visited links for a nice visual indicator using only CSS. Curtis is the name given to a family of geometric sans-serif fonts currently in development. Other incarnations exist as Fontstructions: Curtis Heavy and Curtis Pixel 14. This version takes the form in CSS, yes, only CSS! All shapes are rendered by the browser, using a combination of background color, border width, border radius, and a heavily reliance on absolute/relative positioning. With all of the CSS3 effects and tutorials popping up every day that show all the new and wonderful things we can make happen, we sometimes forget about poor little old CSS2.1 and the great potential it still has. With this tutorial, you will learn how to build and use flexible and advanced hover techniques using CSS2.1 properties.